The String Group is for students grade 1-3. The tutor team nurture the development of the players and incorporate a wide variety of techniques and games to enhance the marked progress that is seen over the course of the week. The musicians are always very excited to perform their varied repertoire at St. James' in the Friday evening concert. The String Orchestra is for students grades 4-6. 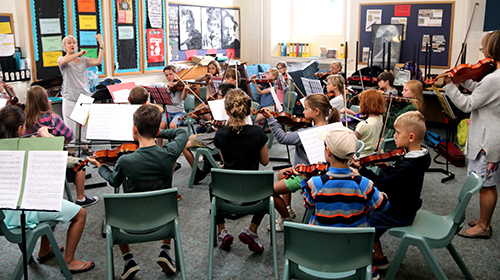 The dynamic team of tutors bring a wealth of experience to these developing string players. 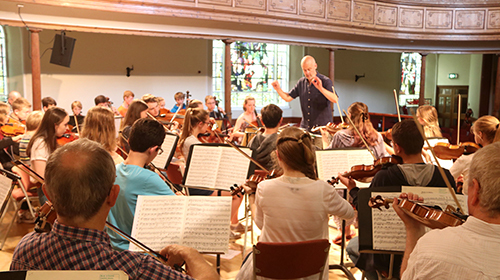 The orchestra has worked on skills needed to accompany baroque concerti through to enjoying arrangements of Modern pop songs supported by the percussion section. 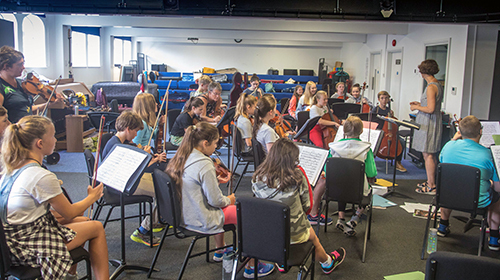 The students really benefit from the different technical areas covered in this group and are equipped to move onto full orchestral repertoire by the time they move on to the Symphony Orchestra. The String Orchestra performs on Saturday evening. The Training Band is for woodwind and brass students grades 1-3. Whether it be Superman, The Incredibles or a more traditional Fanfare the students have a fun week developing instrument control whilst learning to play, listen and watch the conductor. 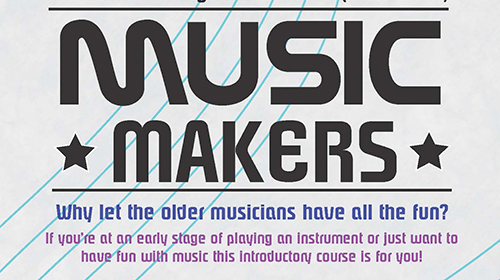 The tutors ensure that the students have a great week of music making. The Training Band perform on Friday evening. The Intermediate Band is for woodwind and brass students grades 4-6. They delve into the huge amount of repertoire available for this outfit of players and there are always fun musical surprises in store for the Saturday evening audience. 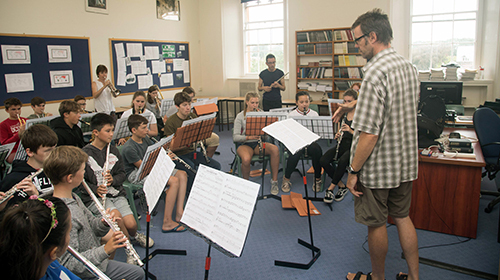 The students benefit from sectional rehearsals with a specialist for their instrument on top of rehearsals for the whole band. 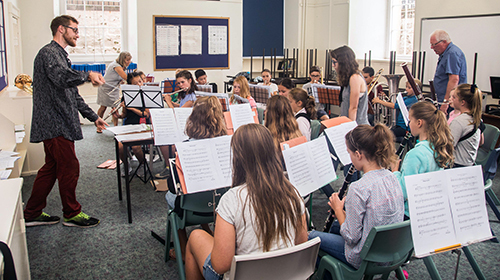 The Symphonic Wind Band for woodwind and brass players grade 7+ gives students the opportunity to step up a level and play more challenging repertoire. Several of the students also work on chamber music and perform in the Friday lunchtime concert as well as the Friday evening concert. The Symphonic Band explore a wide variety of musical styles and have an enthusiastic following. The percussion group is for students grade 3 and above. 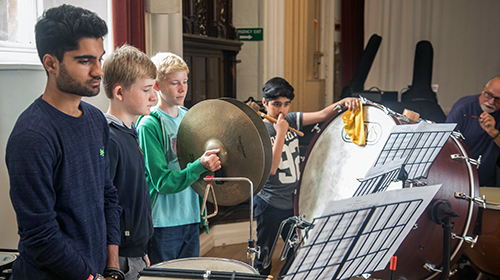 They work on the repertoire for all the main groups and develop skills in ensemble playing getting the opportunity to try a huge variety of different percussion instruments. The students need to be available for both Friday and Saturday night concerts in case they are needed. 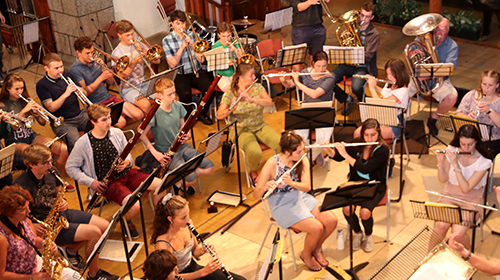 The Symphony Orchestra is for string players grade 7+ and the top level of woodwind and brass applicants to the course. Peter Harrison will be the conductor for the 2018 course and is supported by a team of professional musicians who take sectionals and work intensively with the students to help develop their orchestral skills. The Symphony Orchestra performs on Saturday evening. 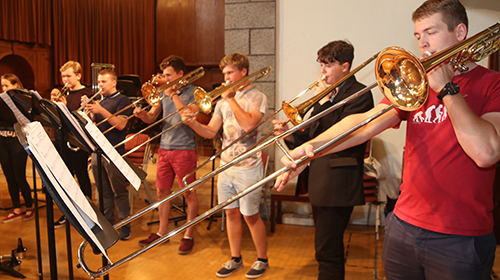 The ECSOC Jazz Band meets from Monday - Thursday 4.25pm - 5.15pm. It is expected that you are at least Grade 6 standard. The Jazz band is open to students who play a Jazz instrument, they do not necessarily need to play this instrument in other ECSOC ensembles. The Jazz Band performs on Friday Lunchtime from 1pm. A mornings only course for music lovers who don’t learn an orchestral instrument or who have not yet achieved Grade 1 on their instrument.